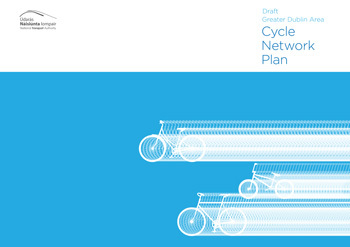 Members of the public and interest groups have until October 14 to give their views on a cycling network plan which spans four counties and with a total route length of over 2,800km. The wide-ranging plan covers city centre streets to greenways and from rural roads to dual carriageways. The report – which includes maps showing the network across counties Dublin, Meath, Kildare, and Wicklow – has taken over a year to produced by the National Transport Authority, its consultants Aecom and Roughan & O’Donovan, and the seven local authorities in the GDA. As per the National Cycle Manual, on main roads and streets where there are large volumes or high speeds of cars, segregation will be used — resulting in cycle paths separated from motor traffic. The network will also make use of local streets for feeder routes; and parks, canals and rivers for greenways. The existing network of cycle lanes and paths were rated for their quality of service based on five criteria: surface condition; width; frequency of conflicts (ie due to parking and driveways); junction delay; and comfort covering proximity to other traffic and the associated sense of safety. The authors used a five-scale ranking quality of service from D to A+ and most routes were rated as poor — read more here on current conditions across Greater Dublin. It says quality regarding widths should be considered separately. It says where there are high peak volumes of demand (500 cyclists per hour) that it is desirable to provide space for side-by-side “social cycling” and room for another cyclist to pass (this is ranked as A+/A). Where there are lesser volumes overtaking space for cyclists to overtake a single cyclist is “sufficient” (ranked as A/B). The plan includes a primary route target of A+/A for width and A/B for other factors. For second routes there is set to be a target of A/B for width and B for other factors. A very small percent of the current network reaches the B rating. Ranelagh Road and Dorset Street also exceed 500 cyclist in the morning peak, while Leeson Street and North Wall Quay both come close to that mark. Along the Grand Canal near Rathmines, Grove Road exceeds 800 cyclists. it is about time that this plan was impelemented, but the question is,will it. a lot of talk has gone on aboutquality cycle lanes, but is it just that,talk. we shall wit and see.